Here's why our contributors aren't fans of ExxonMobil, Diamond Offshore Drilling, and Calumet Specialty Products Partners. With the oil and gas industry picking up the pieces after a two-year slide in commodity prices, investors are likely looking at the energy industry for stocks to add to their portfolio. While there are several good oil stocks out there, there are also a fair share of stinkers worth avoiding. So we asked three of our contributors to each highlight a stock they don't see as a good investment today. Here's why they think ExxonMobil (NYSE:XOM), Diamond Offshore Drilling (NYSE:DO), and Calumet Specialty Products Partners (NASDAQ:CLMT) aren't the oil stocks you are looking for. Rich Smith: Is ExxonMobil the worst-run energy company in the world, or even the worst-performing oil stock? No. But it's a stock I've, er, disliked for a long time, and I'll tell you why. ExxonMobil may only be the fourth-biggest oil company in the world, but it's easily the biggest and best-known American oil company -- 175% the market cap of rival Chevron Corporation. As such, when investors are considering an investment in the oil industry, "Exxon" is usually the first name that springs to mind. It's the standard bearer, the flagship of the oil industry, and a case study in the reason investors should avoid investing in big oil in general. I can sum up that reason in three words: quality of earnings -- or rather, the lack thereof. ExxonMobil reported earning $3.5 billion in the first half of this year, for example. But it produced only $9.3 billion in free cash flow, and after spending $8.9 billion on capital spending, ended up with only $459 million in real cash profits for the period -- its "free cash flow." It's been a similar story for most of the past decade. In eight of the past 10 years, ExxonMobil's free cash flow faile d to measure up to reported earnings, and in the two years Exxon did produce free cash in excess of reported earnings, the difference amounted to little more than a rounding error. Crunch the numbers on S&P Global Market Intelligence, and you'll find similar disconnects between reported "earnings" and actual free cash flow at Chevron, BP, and Conoco as well. Name any oil company, in fact, and chances are good it's not nearly as cash-profitable as its income statement suggests. But ExxonMobil is first in the minds of investors -- and is emblematic of the problem. Ask me to name an energy stock I hate, and it's always going to be No. 1 on my list. Why hasn't this stock been drilled? Sean Williams: I'm personally a big fan of the offshore drilling industry and think some great bargains can be had. However, Diamond Offshore isn't one of them, and I'm downright frustrated watching its share price hold up while many of its peers' continue to sink. There are a few specific beefs I have with Diamond Offshore, but what comes quickest to mind is the average age of the company's fleet. When crude was around $100 a barrel, most of its peers took the time to upgrade their fleets, pushing the average age of their drillships and jackups to between eight and 18 years. Diamond Offshore was a little slow to the game here, and its average fleet age is on the high side of that range at just over 15 years. Older rigs require more maintenance, fetch lower charter dayrates, and are typically less efficient than new-generation rigs. Diamond Offshore also has a substantial amount of near-term and intermediate-term EBITDA loss risk. Roughly three-quarters of the company's 2018 gross profit derives from just three contracts, meaning that if crude prices again worsen, it's possible that one or more of these key contracts could be cancelled. This would rapidly reduce Diamond Offshore's expected EBITDA. Looking a bit further out, most of its favorable contracts that are above current market rates expire by 2020, with roughly 40% EBITDA declines expected in each successive year through then. You'd struggle to find any offshore driller with an uglier EBITDA forecast at the moment. The only available solutions for Diamond Offshore are to cut costs or underbid its peers and take contracts essentially at cost. The company appears to have exhausted most of its cost levers and could struggle to gain new business, given the age of its fleet. It could consider using the low-interest-rate environment to modernize its fleet, but it would have to be spot-on with a recovery in crude prices -- otherwise, its long-term future could be at risk if it becomes mired in debt. There simply isn't an appealing scenario for Diamond Offshore -- which is primarily why this is a stock in the energy sector that I love to hate. Tyler Crowe: I can see the appeal that Calumet Specialty Products Partners might have for income investors. At the core of the business is a specialty petroleum product manufacturer that generates much higher margins than traditional fuel refining and can throw off a bit of excess cash to fuel a distribution. The problem is that this business is buried under a cornucopia of issues from management's poor investment decisions and a crippling debt pile. Back in 2012, Calumet's management went on a spending spree, buying up traditional fuel refineries and even an oilfield services business as a means of diversifying its business. Unfortunately, few of them panned out as they had hoped. The worst example was the Dakota Prairie Refinery in North Dakota, which was mired in operational issues and was ultimately sold at a loss earlier this year. This investment, and many more, was funded with debt. As a result, the company's total debt load has skyrocketed to levels that are simply unsustainable. Today, quarterly interest expenses are equivalent to 82% of the company's own adjusted EBITDA metric. 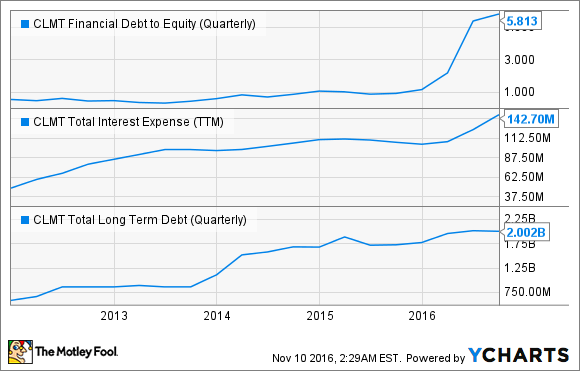 CLMT Financial Debt to Equity (Quarterly) data by YCharts. The company is under new management this year, and its new CEO has pledged to improve operational efficiency and reduce its debt load. It's the right thing to do, but it's going to be a steep uphill battle, and there are no guarantees that the business won't run into solvency issues while trying to make the turnaround. There are just too many issues the company has to fix before investors should consider this a worthwhile investment.